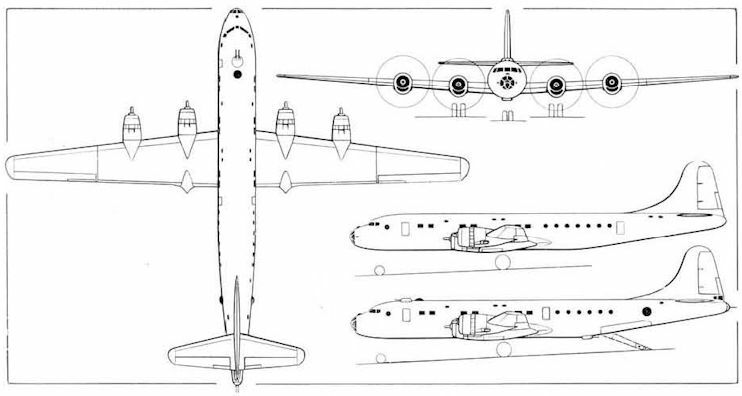 This general arrangement drawing depicts the proposed production version of the Tu-75 military transport, the upper side view illustrating the Tu-70 commercial transport for comparison purposes. The prototype Tu-75 military transport was flown for the first time in 1950. This lacked the defensive armament and ventral loading ramp proposed for the production derivative which failed to materialise. A sectioned view of the proposed production version of the Tu-75 military transport with two remotely-controlled gun barbettes, tail armament, and ventral loading ramp.